There is an enormous amount of sports available to visitors in the city of Seville, and being only minutes away from many nearby towns, rugged countryside and close to the sea, it has many activities to tempt all lovers of the outdoors. Spectators and participants in all sports are well catered for in Seville. Football is more than a sport in Spain and Seville is no exception - it is a real passion and obsession with the locals. 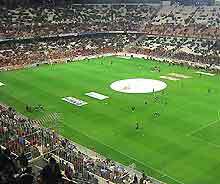 Seville has two rival football teams, FC Sevilla, who play at the Estadio Ramon Sanchez Pizjuan and Betis, who are based at the Estadio de Benito Villamarin. 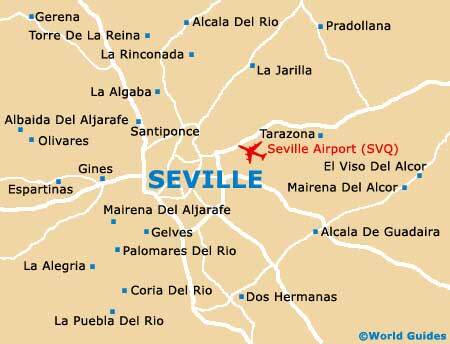 Seville football matches are played from September to May on Sunday afternoons. The main Seville basketball team is the Caja de San Fernando, which often competes against international teams at Complejo Deportivo San Pablo. Golf is a major sport in Seville and the Andalusia area. There are a large number of golf courses available on the Costa del Sol and Seville itself has some excellent golf courses. 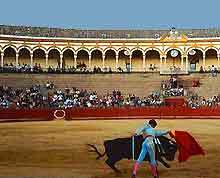 The bullfighting season in Seville runs from April to October and most towns in the Andalusia region have their own bullrings. The vast Maestranza bulling in Seville holds some of the most important bullfights in Spain. Cycling is a favourite sport of the Spaniards and this is particularly so in Seville, where it is both a national sport and pastime. There are several well-equipped fitness centres in this city, with fitness and weight training, aerobic courses, personal trainers, saunas, solariums, steamrooms, hydrotherapy and massage. Most gyms and fitness centres in Seville are open daily. The horse has become an important part of life in Andalusia and Seville, in fact, the city even hold a horse festival in the spring, the Feria de Abril. The nearby city of Jerez de la Frontera also hosts an International Horse Week in May. Horse-trekking is a wonderful way to enjoy the rugged countryside of Andalusia and several riding schools offer lessons in the area around Seville. Watersports facilities are widely available at many of the resorts along the Seville coastline. Nearby Tarifa is a great place for windsurfing and in Seville, the Rio Guadalquivir is a popular spot for sailing, windsurfing and canoeing. Guadalpark is situated to the East of Seville and is an outdoor swimming pool complex that opens during the summer months. The mountains of the Sierra Nevada are home to Europe's southernmost skiing region. The skiing seasons starts from mid-December to May and is a popular skiing destination.